The history of the NHS is deeply embedded within personal histories of birth. It is often a central figure in bringing both ourselves, and our children, safely into the world. While most births occur close to their due date, there are times when NHS neonatal services are essential in ensuring premature newborns not only survive but begin to thrive in the first days, weeks or months of their lives. During the lifetime of the NHS, the ability of medical services to provide care to babies of increasingly low birth weight has helped reduce the infant mortality rate to very low levels. The utilisation of a variety of medical technologies to assist the preterm baby in growing outside the womb, alongside the establishment of dedicated special care units, has marked the survival of premature babies as an NHS success story. At the beginning of the twentieth century infant mortality remained high and the likelihood of a preterm baby surviving infancy was very low. While mortality rates for full-term babies underwent a fairly rapid reduction during the first half of the twentieth century, the fate of premature babies remained uncertain. As the 1946 Maternity Survey revealed no baby under 2lbs 3oz survived and at this was still the case at the launch of the National Health Service. While incubators had been used since the early decades of the twentieth century for creating a controlled environment in which premature babies could be monitored to increase their chances of survival, those preterm babies that did survive often experienced brain damage and both intellectual and physical disabilities. The launch of the National Health Service coincided with an increased commitment to providing systematic neonatal care. In particular, the decades after the Second World War witnessed a marked increase in the types of antenatal and neonatal medical technologies available to the midwife and obstetrician for the safe delivery and care of the premature baby. After the War special baby care units were established, with early units at Bristol, Manchester and Birmingham. However, it was not until after the establishment of the NHS that the availability of these units expanded, growing in number throughout the 1950s and 1960s. 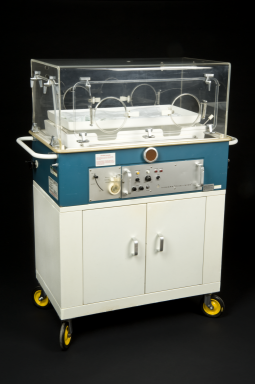 Most early units in the 1950s relied almost solely on the incubator alongside careful infant monitoring by nursing staff. It was primarily used as a way to administer large amounts of oxygen to premature babies to encourage lung development as well as keeping them warm and clean. This reliance on large quantities of oxygen ceased by the end of the 1950s when it was discovered that oxygen therapy could cause retinopathy of prematurity, which can lead to blindness. Instead babies are now provided with a small top-up of oxygen only if needed and when the baby does not need pressure to keep the lungs open. As the century progressed so too did the variety of technological machines used to assist the development of the premature baby. These included, and still include, mechanical ventilation to help the newborn breathe – especially as many preterm babies are born with underdeveloped lungs. These newborns are also fed through tubes to ensure they are receiving the correct balance of nutrients to encourage their continued growth and development. Routine blood sampling obtained from a heel puncture on the newborn is also performed to ascertain blood sugar levels, blood gases and blood counts as well as urea and electrolyte counts. Monitoring systems are used routinely as are life-support machines when necessary. Major neonatal advances since the late 1990s have included the giving of steroids to mothers at risk of giving birth prematurely to boost the infant’s lungs before birth and the use of a ‘cooling suit’ to improve brain function and reduce the likelihood of oxygen-deprived infants developing cerebral palsy and learning disabilities. Medical technology went hand in hand with the care provided to premature babies in special care units. The tailored care provided in such units ensured that nurses needed to be specially trained to operate these machines as well as to provide the type of care required by the newborn. By 1982, paediatricians could train and qualify with a sub-specialism in neonatal medicine, which greatly increased the number of experts employed by NHS hospitals to provide such care. During the early years of the NHS, parents of preterm babies were seen as potential carriers of germs and were consequently almost always discouraged from visiting the nursery, and if permitted in the nursery banned from physical contact with the infant. Principles of care were driven by a clinical focus on sterility and cleanliness and hospital policies of parental exclusion were seen as a necessary consequence. From the 1960s, however, many special care units began permitting parental ‘access’ to their premature babies through large glass windows on viewing corridors, which allowed parents to ‘see’ their babies, while maintaining the hygienic integrity of the nursery as a whole. By the 1970s, parents were allowed enter the special care unit dressed in a gown, hat and gloves and were permitted to hold their babies for short periods during their visitation. By the mid-1970s, almost 18% of all babies born under the NHS were admitted to special baby care units raising concerns about admissions policies, especially as many babies born by caesarean section were placed in these units routinely, rather than by necessity. Issues of cost effectiveness entered the political and medical conversation around special care units especially as treating low-birth weight babies is very expensive as well as labour-intensive. Special care units for babies now almost exclusively specialise in treating very small, premature or congenitally ill newborns. They have also become more ‘parent-friendly’, encouraging the new parent to maintain a strong involvement in the growth and development of their newborn. Skin-to-skin contact is seen as particularly valuable for all but the very frailest babies, recognising the value of emotional attachment for parent and baby alike. Yet, the number of babies born prematurely is on the rise. One in nine babies born in England in 2015 needed neonatal care, amounting to 77,000 newborns, driven in part by rising fertility rates and the increase in age at which women are having children. But premature baby survival rates are also on the rise. Survival amongst those born between 22 and 25 weeks (on average from 1lb to 1lb 6oz in weight) rose from 40% in 1993 to 53% in 2006. 11% more babies born at this stage are also making it to three years old without any of the disabilities often associated with premature birth. While these figures speak to the great strides made in enabling premature babies to survive infancy at increasingly low-birth weights, the rise in numbers needing this type of care has put stress on the already overstretched resources of special care units operating under the NHS. A 2015 Report by Bliss, the sick and premature baby charity, found that 64% of special baby care units did not have sufficient nurses to meet the standards set out by the British Association of Perinatal Medicine, particularly the ratio of one nurse for each baby in intensive care. It also found that 65% did not have sufficient nurses with a specialist qualification in neonatal care. These shortages are worrying for the NHS at a time when neonatal demand is at unprecedented levels and it emphasises the need for co-ordinated, high-quality neonatal care for all babies born prematurely. Yet the true success story of the special baby care unit is the premature baby, surviving against all odds, nestled in an incubator that helps them grow until they are strong enough to leave, go home and begin the next stage of their lives. Humour and the NHS: Is ‘laughter the best medicine’? Is NHS policy a ‘sick joke’? Trying to find survival rates for 1960; 29 wks, 2lbs. Hello, my name is Thomas Kendrick Penland Jr and I was born in New Orleans La at charity hospital on April 20 1956 @7mo. According to my Mother I made medical history for being the first premature to come out of an Oxygenated incubator. I’m sorry for the incompletion of my comment I meet to say I was a complete success of the use of an oxygenated incubator no mental or eye site problems I’ve been trying to find out but can’t find it. Wow thank you for commenting, that is fascinating, it’s brilliant to hear from you. What an amazing invention the oxygenated incubator was! I was 2 months premature in 1946. What did that mean in those days? I was born 1lb premature baby in 16.3. 1960 in belfast. I am now 58. My son was 2lb premature baby in the Royal Victoria Hospital, 11th November 1980. We would love to hear more about your experiences of the HSCNI — we have not heard very much about health services in Northern Ireland, or how the integration with social care has worked and been experienced there. We hear a lot over here in England about ‘loving the NHS’: do you think people feel the same affection for the HSCNI, or maybe do people focus on their local services, like the Royal Victoria? The over use of oxygen happened in the 1970s also. To me. I believe the incubator pictured is the the Vickers 5:9 (historically a baby under 5lb 9oz was considered premature), I owe my life to this machine, and the staff at Southmead Hospital, Bristol. My favorite photo is of myself alone in this incubator at 13 weeks, still only 3lb 12ox, and mostly nappy! !